44 entries categorized "Current project"
I have always had difficulty categorizing my work. In fact, when someone asks me what kind of art I create, I just hand them one of my brochures and let them make up their own mind. I find that so much easier than saying I'm a quilter because everyone has an image in mind of what a quilt is, namely a blanket with block designs like their grandmother made. Even if someone knows what an art quilt is, that doesn't help because what I create is so different from what other art quilters make. I finally started to call myself a conceptual artist, for lack of a better term. Sometimes I call myself a sculptor, but since I also make wall hung work, that doesn't always apply. Recently, I've read about a new category of art that is called conceptual craft or conceptually-based craft. It is being made by artists who work in what are considered to be traditional craft mediums, but who create fine art with it instead. The concept is the important thing, not the functional or decorative qualities. So, is what I make fine art or or fine craft? As the prominent painter, Roger Shimomura, once said about my work, "There is a split second of non-recognition of what I'm looking at, which should be taken as a compliment given all the things I have looked at and evaluated in my life. You sit right on that dangerous border between art & craft and I respect that stance." So, I guess it's both and it's neither. Here's a gratuitous picture of a new work that I've thrown in to make this post a little less boring. 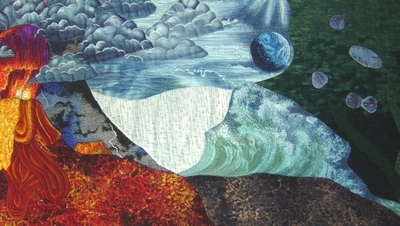 This whole piece is only 8" square and is destined for a traveling exhibit for SAQA's 20th anniversary. 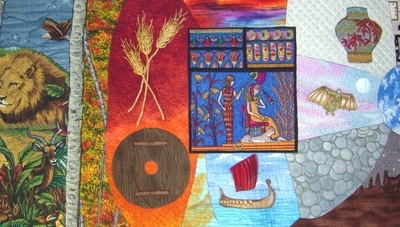 It is a non-juried exhibit and will travel for a while, then be given to the International Quilt Study Center for their collection. I don't need that particular line on my résumé because the IQSC already owns a quilt of mine, but I made this as a challenge to myself. I wanted to see if I could make a miniature artwork that was 2D and still reflected my style. When the organizers receive it, they will mat and frame it, so I didn't even need to finish the edges. 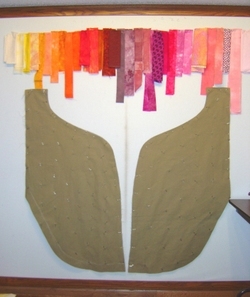 I even have a second long, skinny quilt like the one I used here that I will make into an artwork for me to keep, although I will probably make the overall size 8" x 10" instead. I spent the last week processing a bunch of pears that a nice lady allowed me pick from her orchard. All in all, I probably canned about 100 jars of various jams, jellies, sauces, juice and preserves. If that wasn't enough, I also made 50 servings of chili from my homegrown tomatoes and green peppers. My feet are tired. My brain is fried. My tastebuds are happy. All this food preparation is spilling over into my artwork, too. If you've been reading my blog for a while, then you may remember a piece called Portable Picnic. 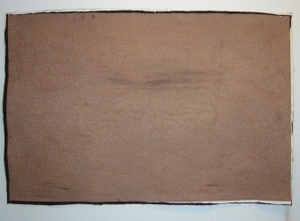 A collaborative project, it was originally shown at Untitled[ArtSpace] in Oklahoma City in January. Unfortunately, the other two artists in my group wanted their work back after the show was over. Go figure. I was left with a nice ground cover, cushions, tablerunners and napkins but the dishware, silverware and vase were gone. Never being one to let a little thing like that stop me, I decided to finish the picnic scene myself and exhibit it as a "new" artwork, called Picniced. I finished the food this week and here's what it looks like. If you can't tell from the picture, I'm serving a bag of potato chips, a BLT sandwich and a dill pickle. The sandwich and chips bag are made entirely of fiber materials, but the pickle was created from a lightweight clay and painted with acrylic paints. The best part of this project is that I got to eat the food models as I went along. Only one serving of food is shown here, but there are actually two, one for each of the two seats at the picnic. There used to be three servings, but I think my husband had them for lunch yesterday. I told them they had fiber in them and he must have misunderstood. This is one of the actual plates I'll be using. The next step is to sand, stain and finish the wood so it looks a little darker and classier. I still haven't decided what to do about the drinks yet. If I create some fake soda cans. I'd better buy several real ones at the store for models so I have something to drink while I work. I won't replace the original silverware since all I'm serving is finger food. Have you ever tried to eat potato chips with a knife and fork? I've been finishing some projects that have been sitting around for a while. This one has only been around for two or three months, but it's getting close to completion now. If you recall my post about creating a color run, this is how I used the one shown. It's a new work called Collapsed. 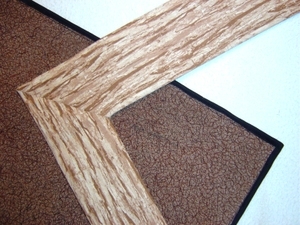 The first picture is how the fabric strips looked after they were sewn together and mostly quilted. 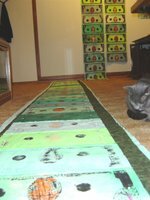 The two side edges were then sewn together so the quilt created a tube and binding was applied to the top and bottom edges. As you might imagine, when you set it on a table, the whole tube collapses under its own weight. Hey, what a coincidence, that's exactly what I wanted it to do! It looks different from each side and the tube will collapse differently every time it's installed. I am currently working on a wood base that the bottom of the tube will fit over and there will be six legs holding up the base. I don't have the base cut out yet, but I am in the process of staining and finishing the legs, which are 27" high and were purchased at the local home improvement store. Go ahead and call me a wimp if you want, but it was a lot easier to buy them than to make them. I just finished a couple of pieces I've been working on for a long time. I'll be shipping them out to the photographer next week, so here's a sneak peak at one of them, Unmatched. Yesterday, I showed it to a 10 year old girl and she had no idea what it was. I guess she's never seen a matchbook before. Boy, do I feel old! We have our final winner! 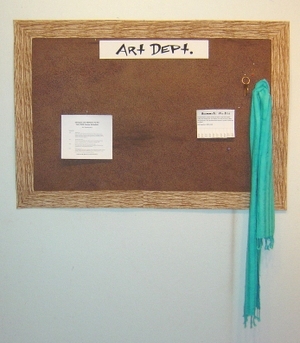 Terry Grant correctly guessed that the two words at the top of the bulletin board say "Art Department". I started making the sign for it today and you can see it in the picture, but it isn't finished yet. The whole project looks pretty boring right now because the only colorful thing on the board is the scarf in the Lost and Found section. It should only get better from now on, as everything else that I plan to attach is going to pop with color. It's better to use "boring" as a backdrop if you plan to have a lot of color in the artwork. Congratulations to Karen Stiehl Osborn, Jeri Riggs and Terry Grant, the winners of my contest, and thanks to all of you for participating! The Earth, as it is today, appears in the center. The other human accomplishments shown here include a beautiful vase (representing the Asian cultures), clocks and the telescope. The navy blue area represents the formation of the United States. The bottom picture shows the Old West. The cowboy on the right is telling a tall tale about the future, when a middle-aged woman puts their picture on a quilt and writes about them on her blog. Unbeknownst to him, the other cowboys are taking the opportunity to sneak off and short sheet his bedroll, because they think he is so full of baloney. In the last picture, you see the end of the timeline. Yes, we've finally gotten to the present. Agriculture and farms are at the bottom and to the right of that, Neil Armstrong is walking on the Moon. 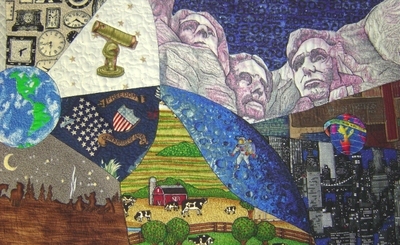 The fabric above the Mount Rushmore heads is some I purchased during the year 2000, which is probably why it has the number "2000" printed all over it. In the lower right, you have computers, the Internet and modern cities. This brings an end to our little tour of history. If you want to know what happens next, you'll have to stick around and see for yourself. This quilt has been a work in progress for ten years. I finally finished quilting it and trimmed it to size. I also attached a black facing strip to the top and bottom edges, to stabilize them. I am currently embellishing the Big Bang with lots of shiny stuff. By the time I'm done, it'll be renamed the Big Beautiful Bang. Here's the Ice Age as it looked about 75,000 years ago (Greenwich Mean Time). I drew the caveman and cave paintings freehand and was afraid that they wouldn't look right after I quilted them, but they do. 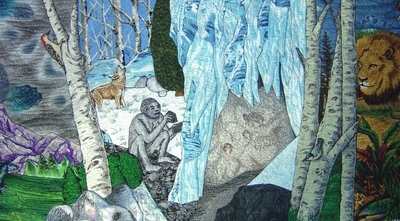 Notice that the caveman is sitting outside on the frozen ground without any clothes on and he's banging a couple of rocks together. A wolf is right behind him and he doesn't seem to notice that, either. He wasn't exactly the smartest guy in his clan, which is probably why everyone else is selling their ice cave and moving to a more upscale forest further south. The Ice Age ends, as do sabertoothed tigers, wooly mammoths and people who sit naked on the ground in the dead of winter. They are replaced by smarter, better-clothed people and other types of animals, such as poodles and potbellied pigs. 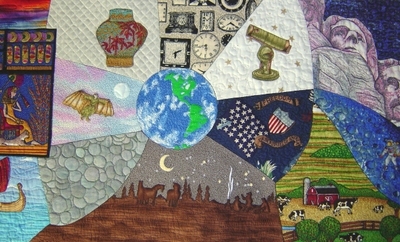 This takes us into the final section of the quilt, which covers the wide range of human accomplishments, although I completely forgot to include a reference to the Ronco Pocket Fisherman. Maybe next time. The third picture shows the domestication of grain, the wheel, ocean-going vessels (the mast will be applied later), the Egyptian civilization and money. Somewhere along the line, as I was transferring the image to fabric, the coins lost their faces, so I'll have to draw them in myself. As you've seen, I'm not very good at drawing, so they may end up looking like smiley faces instead of the Emperor Nero. The flying monk with the homemade wings is Eilmer, also known as Oliver of Malmesbury. In 1010 C.E., he jumped off of a building and successfully flew to the ground. Other men had tried to fly before, but Eilmer attached the wings to his ankles and was the trick that worked. Unlike the other so-called "tower jumpers", he lived to tell people his name. I'm not making this up. Back at the palm trees again. 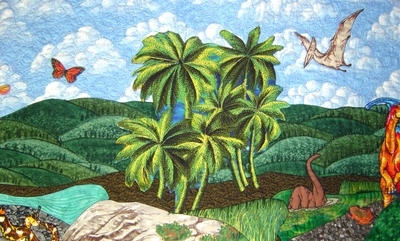 I just discovered that palm trees didn't actually appear until 80 million years ago (mya), even though I placed them here around 250 mya. Big oops, but it's far too late to fix the problem. You'll just have to imagine that some scientist from the future discovered time travel. When he tested his machine and went back to the beginning of the Triassic Period, he happened to have a coconut stuck on the sole of his shoe, where it inadvertently fell off and was left behind when he traveled back to the future. The coconut sprouted and this little stand of trees was the result. Thankfully, it was wiped out when a tornado happened to touch down in that very spot 249,999,997 mya and the proper timeline for palm tree evolution was restored. Finally, the dinosaurs appear and frogs try very hard to stay out from underfoot. The pterosaur is easy to see, but there's also a little white bird to the right, midway between the orange and green dinosaur heads. I plan to add another bird or two later. Flowering plants appear and the T-Rex is happy that they do. If you notice, he is stalking the orange dinosaur. The T-Rex, named Chad, intends to pick a few flowers and offer them to the orange dinosaur, Dave, thus confusing Dave and throwing him off-guard long enough for Chad to make his move. Little do they know that their one-on-one is about to go horribly awry, as a gigantic asteroid (the red ball) streaks through the sky and hits the Yucatan Peninsula. I will add the asteroid's fiery tail later. On left side of the third picture, you can see the scorched earth and darkened skies that were the collision's aftermath. Sadly, Chad and Dave did not survive, but Chad's bones were dug up a just few years ago and they are now on display in a museum labelled with the name of "Sue". I guess that finally explains why he wanted to pick flowers for Dave. Just to the right of the dark clouds, you can see Earth. Pangaea has split up and the continents are now drifting apart. Once things settled down a bit, it was a time of mountain building. Horses and other mammals started to look like modern types. These two are going for a pleasant romp in the moonlight. I actually finished quilting Evolved this weekend, but these pictures were taken before everything was done. The first picture shows the part that comes right after the volcanoes and rains. Notice that you can see the cooled land under the wave on the left. Now we are under the ocean. Fred (the fat one) and his one-celled friends, Wilma, Barney and Betty, are swimming around in the primordial algae. This is a picture of Wilma from when she was very pregnant and about to divide, spawning cute little Pebbles. Later, a couple of happy little trilobytes, the Barbie Twins, play tag around the plants. Finally, right around 570 million years ago and fashionably late, the shellfish and sponges join the party. They love making an entrance and they never bring a hostess gift. Can you imagine? In the second picture, you can see a couple of jawless fishes and more advanced marine plantlife. The first land plants appear and the arthropods climb up out of the water. You can't see my arthopod yet because he's going to be created by embellishment later, so you'll have to use your imagination for now. He'll be on the left edge of the black rock. The lungfish is next and more sophisticated land plants appear, like ferns. Up in the sky are gigantic dragonflies. Right now the dragonflies have no bodies, but they'll get them soon. I just couldn't figure out how to applique anything that narrow. Sitting on top of the waterfall is the first amphibian and sunning himself on a rock in the bottom right corner is the first reptile. This is a time of insects, trees and swamps. I'm sure insect repellents would have sold well back in those days. If there were people and convenience stores, that is. The third picture pans over a little more and you can see the butterfly. I'd name it after my Russian grandmother, Agatha, but then I'd feel obligated to name every single animal that appears after this and there are quite a few yet to come. In the background are coniferous trees and I'll be adding vegetation around the swamp at some point. At the far right are palm trees. 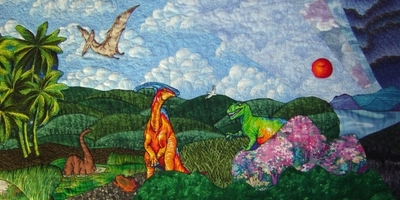 You are now located about halfway across the quilt and 300 million years ago in time. I posted this picture before, but wanted to put it in sequence with the rest of Evolved. Here. you can see the galaxies forming on the left and the planets forming on the right. 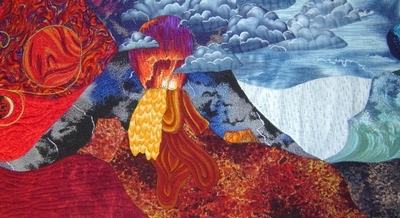 There are places on this quilt where I show the state of the Earth at that time and you can see it in the upper right of the picture, portrayed as a hot, molten ball. This section, like many others, will be embellished with metallic trims, beads and anything else I can think of. Since I had posted this picture before, here are two new ones. In the second picture, you can see the molten Earth in the top left. The Earth's surface begins forming because of exploding volcanoes and lava flows. There is one big volcanic cone in the middle, plus two in the background, on either side of it. I will add the explosions on the smaller cones later with embellishment. Clouds of smoke and water vapor emerge from the main volcano and form storm clouds. The clouds begin raining and cool the land. The third picture shows the clouds, the rain and the oceans forming (see the waves?). Right above the waves, a brand new and much more serene Earth is shown, surrounded by clouds and water. To the right, you can see one-celled life forming in the oceans. Surprisingly, the atom I mentioned in the last post can also be seen here. If you look at the largest of the one-celled animals, Fred, it's part of his elbow, too. This takes us up through about four billion years ago. However, you will need to take Daylight Savings Time into account. Wow, I thought it would be easy to guess the words at the top of the board. Some of the commenters are on the right track with one word or the other, but no one has put it all together yet. 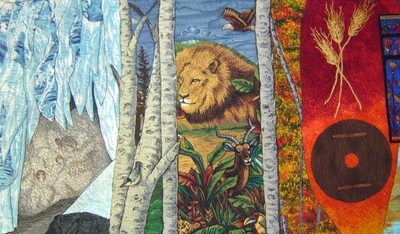 Here is the next big clue: most art quilters have never have been around a board like this on a regular basis. Even fewer traditional quilters have been around one. It may seem like I'm giving up on this project because I've dragged Evolved out of the unfinished project pile again, but that is not the case. 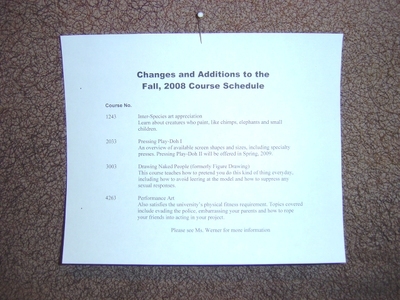 It dawned on me that the bulletin board needed to grow over time. It won't go on display until August and I'm sure that I'll think of many items to post on it before then. Rather than forcing the idea, I'm going to tack items to the board as I think of them. 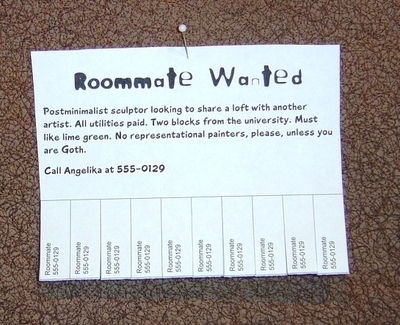 The contest will be wide open until the third question, "What are the two words at the top of the bulletin board?" is answered. In the meantime, I will post pictures of Evolved to show you how it stands right now. 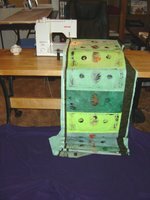 The machine quilting is almost completed, but I will still need to trim and bind the edges, then heavily embellish the pictures. Please remember this is a work in progress. Here is the Big Bang, the first part of the timeline. It's located on the left end of the 18 foot long quilt. I plan to bead and decorate the surface even more after the binding is on. As with all these pictures, the quilt is 12" high. Here's the next section to the right. 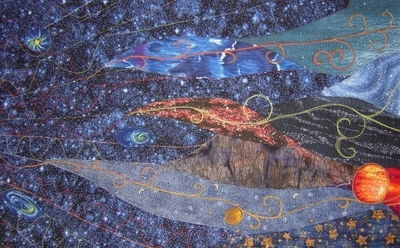 It shows the formation of the galaxies and the beginning of the planets. I'll continue to post pictures two at a time until I've covered the entire quilt. Remember that you can click on the images to see a larger version. By the way, a small atom portrayed as part of the planet at the lower right corner of this picture is now part of my elbow. I thought you might notice the resemblance. If this hint doesn't produce a winner, I don't know what will. Here's another item for the bulletin board. If you click on the picture, you'll see a larger image so you can read it. Remember, I'm looking for the two words that will be at the top of the board, that will explain everything that is pinned on it. The first person who guesses those two words by leaving a comment on this blog wins the final prize. Today, I attached several "lost and found" items to the board, including a keyring and a lone earring I made. I also attached Jeri's prize, but I'm not going to tell her what it is yet. Once someone guesses the words at the top, I can start posting some more colorful items. Thank goodness, because this whole brown and white thing is extremely depressing. Right now, I need a healthy jolt of rich, saturated color injected directly into my veins to boost my energy again. I understand that lime green is always a reliable choice, but for a quicker pick-me-up, a little fire engine red can work wonders. No one has guessed the two words at the top of the bulletin board yet. Hint- the two words indicate the place where the bulletin board is located and the kind of people who would be posting on the board. Another hint- the next flyer I created, which is partially entitled "Changes and Additions" mentions chimps, elephants and small children. What do these have in common? In case you were wondering, the piece of paper I showed in my last post does not represent the type of prizes I will be giving out to the winners. I promise that the prizes will be a lot more valuable than that! In fact, I will be making small works of art to give away. You won't be disappointed. Do I have a picture to show you today? I guess not. Maybe tomorrow I'll make something and show you, now that the laundry is done. We have the first two winners! Karen Stiehl Osborn from Nebraska, USA is the winner of the first prize. She correctly guessed that I was making a cork bulletin board. I know Karen from the Kansas Art Quilters group and we are on the board of directors together. I couldn't be more pleased that she is the first winner. Her prize will be one of the bulletin board items I create for this project. I will display the corkboard as part of my solo exhibit next August/September, then send the prizes to the three winners. Jeri Riggs from New York, USA is the winner of the second prize. She correctly guessed that the name for this artwork will be Posted. I met Jeri through art quilting, but she happens to live just a few blocks from the house in which I grew up and she goes past it nearly every day. She is also one of the neatest people I know and a very dear friend, so I'm glad she won the second prize. Yay, Jeri! There is one more prize to be won. There will be two words of text on the top of this bulletin board (the "title") and you need to guess what they are. The picture shown here should be a real giveaway. The first person who can get their comment posted telling me the two correct words will win the third prize. I haven't decided yet if this bulletin board item will be made from fabric or if it will stay paper, as shown here, but this is the first draft of how it's going to look. Since my last post, I covered the raw edge of the quilted piece with binding and did most of the work on the second piece, which looks like wood. I still want to do some more quilting on the newer piece. OK (drum roll please), here's the giveaway I told you about. I roughly pinned the two pieces to my design wall so you can see how they will look together. The first person to guess what this represents will win my first prize. Leave your guesses as comments on this blog entry. Good luck! The quilting is finished! I trimmed the edges and pinned it to my design wall for the picture. It's square, but my camera shot isn't. This quilt now measures 43" wide x 28-1/2" high and I will not be changing the surface anymore, so this is the way this part will look. 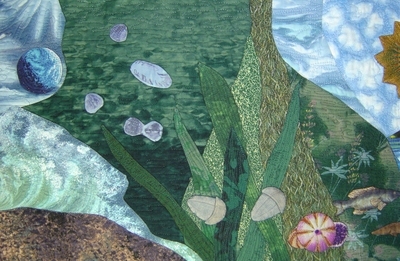 I'm also going to include a closeup picture so you can see how closely this is quilted. 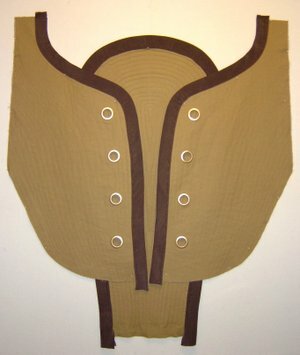 I used many shades of brown and used up over 20 spools of thread. I think I have now gone officially insane. The next step will probably be the part that will give you the clue you need to figure it out. I have been loving all your guesses so far! They range all over the place, but they are all intriguing. I promise that this project will start looking a little more interesting soon. This is meant to imitate a natural material that we all have somewhere in our home, often in many unseen places. I'll admit it. It's going to take 2-3 more days to finish the quilting on the mystery artwork, so you may not hear from me till I'm done with that stage. Everything still looks like it did yesterday, so I didn't post a new picture for you today. To make up for that, here's a gratuitous picture of an untitled and unexhibited piece I made about 6 months ago. It's never been seen before outside of my studio. I decided to trim the edges, but otherwise leave it as one piece. I also decided not to paint over the top, as it already looks perfect. In fact, it's eerily like the stuff it's supposed to be representing, even from close up. I already started creating some other parts for this mystery artwork, three of which will become the prizes in this contest. You haven't seen them yet because you'd figure out the mystery too soon. I'm going to make you wait, yes I am. The next step that I do after the quilting will be the real giveaway. I'm still quilting the same piece. 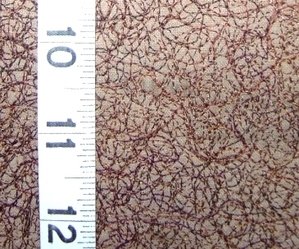 If you click on the picture, a larger image will be displayed, where you can see the texture being created by the stitching. I'm hoping to be done with this tomorrow, but I've been saying that for the last three days. 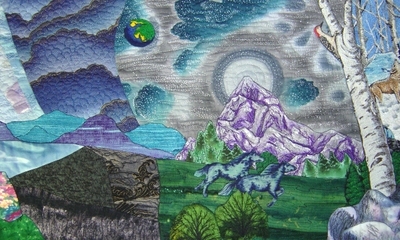 Recently, I've developed the tendency to obsessively quilt my work and this piece is no exception. I'm not really crazy, I'm just a bad quilter. I figure that the best way to hide my mistakes is to hide them in millions of other stitches. It works for me. I can't begin to tell you how many spools of thread I have already emptied while quilting this piece. I've probably used up at least 15 so far. I'm about to send off several pieces to be photographed, but thought I'd have a little fun first. So many of my artworks are such big productions that I wanted to make something that would only take a day or two. I whipped this up from pieces left over from Extruded and Triangulated. This is an actual quilted wallhanging, but it's quite stiff because, with one exception, there is buckram inside of the strips instead of batting (buckram is the stuff they use to stiffen hats). The finished size is 18" square. Notice that each strip is heavily quilted in straight lines. The stitching holding the strips together is kind of wavy, but I don't care. Sewing over the buckram was like trying to stay on a straight line on the highway when you are getting blasted by gusts of high winds from each side. The stitching had a mind of its own. I don't know the title yet. I contemplated Isolated or Exiled, but those sounded too dreary. Another possibility is Partitioned, which isn't exciting, but also doesn't make me sound like I need psychotherapy. I finally finished Laced and I'm currently putting on the final touches, like the label. I was concerned about the weight and whether it would hang properly, but it is "only" seven pounds. On the back, I sewed a traditional hanging sleeve at the top and three D-rings down each of the back sides as extra support points in case they are needed. There is a show deadline coming up in the middle of January, so I hope to have this professionally photographed before then, along with a couple of other new works. My Boston photographer really earns his money, because my work is not easy to set up for the camera. Despite it all, he has never disappointed me and continues to produce fabulous pictures. Today, I was feeling rather envious of the artists who slap some paint onto canvas and call themselves done. This was a lot of work and that's no lie. Creating artwork using this medium is like beating myself about the head and shoulders with a big, colorful, wet, skinny quilt. I recently posted about a collaborative project for an upcoming dinner-themed exhibit at an Oklahoma City gallery. Today, I delivered my portion to one of my collaborators (don't we sound like we're up to something?). The ceramics were made by Barbara Broadwell from Edmond, OK and the pewter pieces by Margareta Grill from Tulsa, OK. The theme of our project is Portable Picnic. Now it's possible for you to have a picnic anywhere, even indoors, including a beautiful view of a pond! I finished my contributions to the project in less than two weeks, including the groundcloth with the pond scene, one green tablecloth and one beige tablecloth (layered), two green cushions and two napkins. 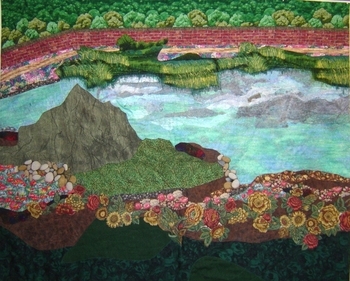 Some parts of the pond scene and several other pieces were sewn about 8 years ago for a project that was never finished, so I was glad to find a home for them after all this time. 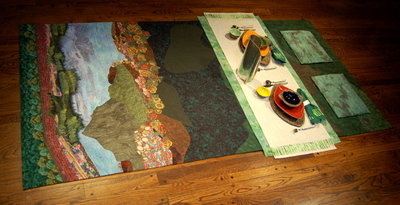 The tablecloths, cushions and napkins have various amounts of fabric stamping and hand dyeing on them. I had to make them special so, if anyone bought them, they'd actually feel like they were buying things that were one of a kind. Which they are. Tomorrow, I'm going back to working on Laced. I never thought I'd be happy to see it again because it's been a difficult piece to design and build, but I'm ready to tackle it with renewed enthusiasm. Can't you just hear the flow of creativity being pumped around from one project to another? Glug, glug. I haven't posted in a while because I was suddenly faced with completing a project in a short time. It's for a collaborative exhibit at Untitled [ArtSpace], an excellent gallery in Oklahoma City. The exhibit, Dinner in the Deuce, will start in January, but I've known about this project since last Spring. Due to situations within our group, I couldn't proceed on my part of the project until very recently. Unfortunately, the deadline for the finished pictures is December 1st, so I was given about two weeks to do my part. Whoop whoop whoop, man the battle stations! Throw all my other projects aside! I am working with two other artists, one a ceramicist and one who works with metal, primarily pewter. Together, we are creating a picnic dinner by the pond. They are producing the tableware, like the dishes and the teapot, and I am creating all the fabric-related items. 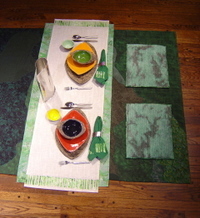 My idea was to seat the two diners on a groundcover that looked like a grassy area with a water scene on one side. This is how the groundcover (about 50" x 100") looked as of Wednesday night. 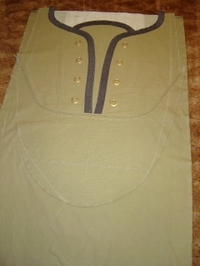 Since then, I've added additional detail and right now, I'm stitching the fabrics onto the base. Tomorrow, I'll trim and bind the edges of the groundcover. This weekend, I'll make a separate tablecloth and two cushions. 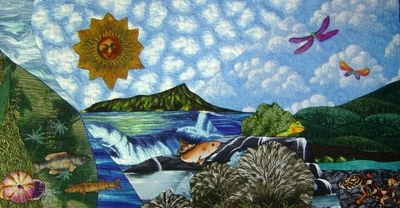 Now I remember why I don't do picture quilts anymore. Now I remember why I don't do big quilts anymore. Now I remember where I hid those two large cabinets full of commercially printed fabric. I plan to hide them again when I'm done. I have been working pretty hard on this project since I last posted about it, but there wasn't much to see for a while because I was constructing another quilt to function as the background and support for the front. I'm going to show you a few pictures so you can see how it's progressing. This first picture was taken a while ago, after I finished the upper part of the shoe. I pinned it to my design wall and laced it up so I could see how it looked. I chose this lacing pattern because it made the colors of the lace more visible and pleasing. The second picture shows the current state of the project. The upper and inside sections are now basted together, but the tongue and grommeted area will eventually float free. This is now so large and heavy that I did not pin it to my design wall, but placed it on the floor so you could see the whole thing. I had to take the picture while standing on top of my work table with the camera almost to the ceiling. Notice the faint white chalk line on the right side of the upper, which marks the line where I will trim back the side. Rather than trying to make the shoe shape asymmetrical, the curves will be the same on both sides. You can still see a chalk line on the left which was my attempt at a more realistic shaping, but I couldn't make it look right, so I'm chickening out and making them the same. Hey, it's my project. The third picture is a detail shot. The light part of the background quilt is made of a foam-backed upholstery fabric which looks squishy (don't you love that word?) like the inside of a real sneaker. The two pieces to the side, which are supposed to look like the inside wall of the shoe, are made of the same canvas as the rest, but overpainted with a wash of white acrylic paint to lighten them up. You can see all the basting stitches, which were necessary to prevent the various pieces from wiggling out of place while I worked on it. Keeping everything straight was a real pain in the neck, requiring a carpenter's level and a extra-long measuring tape. The next step will be to trim the sides of the upper, after which I'll add a white crinkly fabric that will go around the bottom, tapering part way up the sides of the upper, simulating the rubber edge. I purposely left a lot of extra background fabric to provide a base for this white fabric, as it is not as sturdy as the canvas. The only thing that consoles me in this project is that real sneakers are probably just as hard to make as this one has been. Those workers in China really earn their money. Next time you see them, please tell them that they have earned my respect. The lace is done and I even put the aglets (tips) on it, using shrink wrap tubing. Don't they look cool? 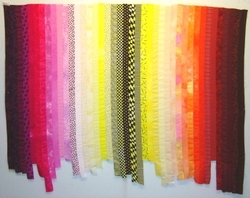 The lace/quilt is 2" wide by 25' long and the aglets are 6". The next step is to create the toe section for the sneaker. I've been dreading this part because it's going to be harder to do properly than the rest of the pieces were, but I'm a big girl now and I'm sure I'll get through the process without too much hair pulling. My fingernails may get bitten off, but the hair should remain in place. I finished the shoe's tongue. I always make the pieces too big and then trim them down, so all three of these sections are extra big right now. The bottom section of the tongue will be cut off at the correct length when I am ready to assemble everything into the final form. Today, I cut the fabric for the "lace", layered it with batting and began quilting it. Although this is one of my shorter quilts, I'm using a modified version of my usual system during the quilting process, letting the quilt fall into a box on the other side of the table. When the quilt is longer, I have a box on my side of the table, too. Notice the flourescent orange thread I'm using for the quilting. Did I mention that I like bright colors? I completed the upper part of the shoe. To give you a sense of scale, these pieces are 50" from top to bottom. By the time I'm done making this shoe, Shaquille O'Neal and the Jolly Green Giant might be knocking on my door, asking to try it on. I bet Manolo Blahnik never had that happen. You can see the beginnings of the lace over on the left side of the picture. I've now completed enough to be able to calculate the length of the lace I need, which is about 20 feet. If that sounds like a long quilt to you, remember that I recently made one that was 70 yards long for Knitted. Now THAT was a long quilt. 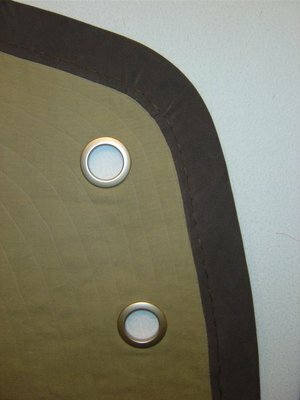 The binding is a stretch suede knitted fabric. 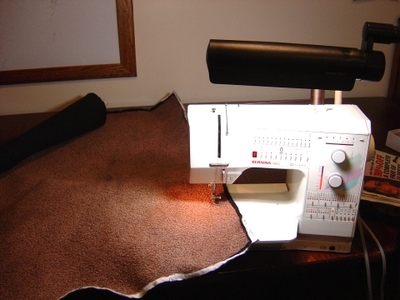 I added large decorative stitches about 1/4" from the sewn inner edge of the binding to mimic the machine stitching you would see if the shoe were normal size. I needed giant sized grommets and spent a lot of time prowling through home improvement centers and hardware stores, but the ones I found were all too small. I also called an awning company and they wanted to charge me a minimum of $40 to install them, even though they expected me to supply the grommets, too. Finally, I found drapery grommets, intended to be placed at the top of lightweight curtains so you can thread a curtain rod through them. They turned out perfectly. There is enough canvas left over to make the shoe's tongue, but I needed more to create the toe area.This morning, I went back to the fabric store and to my surprise, they had just enough canvas left for what I needed and a little more. This never happens, so I bought it all. I'll have to wait till Monday to prewash the fabric because six yards of canvas is too heavy for my washing machine. The tub would start bouncing around so hard that my machine would probably walk across the floor and out the door, taking a nice stroll in the park. Like last time, I'll visit the local laundromat and wash it in the double loader. I hope I can get out of the place without getting a tattoo or grafting a small child onto my hip. Oops, did I forget to mention that I've been working on a new project? The other one I was telling you about, Dispensed, is very close to completion, but I have also started on a new one, called Laced. I sketched out the idea some time ago, but wasn't ready to work on it till now. 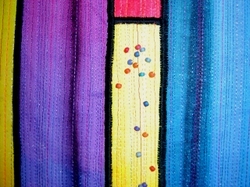 This artwork will be suggestive of a sneaker with colorful lacing. I'm using a cotton duck/canvas to build the sneaker body, which is a very heavy fabric, but looks makes the piece look more authentic. I chose the khaki color because I wanted a medium neutral, to set off the bright colors of the shoelace. First, I cut out the most critical section of the shoe, the part that goes across the top of your instep. 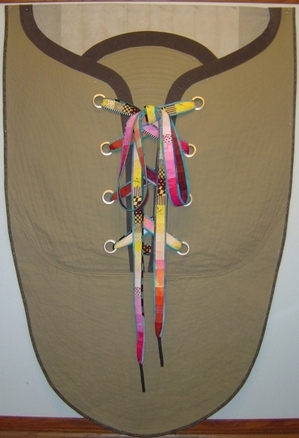 If you click on the picture, you should get a larger image, where you can see the safety pins that are holding the three layers together until I can quilt them. I plan to put a large, dark binding along the inside edge of these two shoe pieces, quilt them and then install large grommets in the right spots. Later, I'll attach a toe section and possibly a white strip around the outside, to look like the edge of the sole. There will also be a tongue, which will hide the hanging device at the top. In the first picture, you can see one of my attempts at creating the color run for the shoelace. It actually took me about two days of work to establish the final colors and the sequence of fabrics. The second picture shows the chosen fabrics after they were sewn together (I haven't even ironed the seams flat yet). 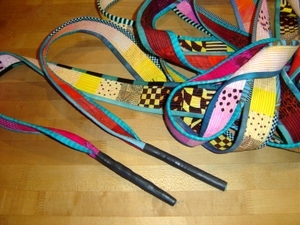 Once I have a better idea of how long a shoelace I'll need, I'll use this construction to build one of my trademark long, skinny quilts, which will probably end up about 2-3" wide. The black/yellow colors will end up at the center/bottom of the shoe's lacing. 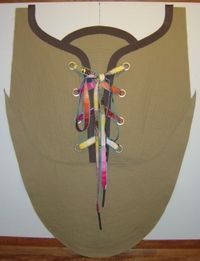 I can extend the length of the shoelace as needed by cutting this construction into strips, turning the pieces around and sewing them onto the ends of the main strip. I made the left side magenta and the right side orange, so it will look more interesting as the lace crisscrosses back and forth. The quilt binding will be bright turquoise blue. My next task is to construct the shoe. I actually purchased a $5 pair of white sneakers so I could use them as a design reference. By total and complete coincidence, they happen to be in my size. I solemnly promise that if Laced gets into a good show, I will paint the sneakers and shoelaces to match my artwork and then wear these shoes to the opening reception. I think I need to spit on my hand to seal this pledge now, to show that I really mean it. Or have I got that spitting thing mixed up with something else? In between processing loads of tomatoes, tending the gardens and cleaning the house, I've been working on Dispensed. The holder is now made and waiting for the finish. This particular type of wood does not take stain very evenly, so I will probably paint it. I haven't posted about my latest project in a while, but the type of work I've been doing is long and tedious. Non-artists often believe that art magically springs from an artist's fingers, but there's usually a ton of work involved. To top it off, the picture I'm showing probably doesn't look very different from my last update, as the changes are subtle. In case you're wondering, there are 24 dollar bills in all, 16" across. First, I machine quilted the surface of the bills very densely, with the exception of the light blue "lettering" at the top and bottom. The dense stitching gives the bills the visual texture of a paper towel. I would have done the lettering too, but I'd already spent weeks on the quilting and couldn't stand doing one more minute without going bonkers. Centuries from now, art historians will debate the issue of why I didn't quilt the last little bits, looking for some deep artistic compulsion on my part, but now you know the real truth. Next, I touched up the black areas, painting right over the quilt stitches. I decided that I wasn't going to add any more detail to the bills after this in order to leave them suggestive of real dollars, rather than copied from them. The only exceptions will be some slight "modifications" of Washington's image on some of the bills deep within the roll. I'd like to see what he looks like with a mustache and maybe even a pierced nose, wouldn't you? I am currently gathering the materials for the holder, including 1-1/2" black PVC pipe, which will be the equivalent of the cardboard tube. A small experiment showed that the weight of the quilt causes it to unroll by itself, so the holder design will include anti-rolling features. This project is actually getting close to completion. I'm a little tired of the color green, however. I'm in the process of quilting the dollar bills and it's going to take a while. I realized fairly quickly that there was no way to do a distinctive design in the green area without having it dominate the look of the bill, so I'm quilting everything so heavily that you can't tell what an unimaginative machine quilter I am. It actually works well for this project because the quilting becomes a subtle texture and a great anti-conterfeiting device for the U.S. Treasury. Click on the picture to see a larger version. I bet my bottom dollar that you can see the quilting on the bottom dollar. It hasn't been ironed yet, so it looks a little rippled. I intend to do more quilting in the black areas, plus add some other painting to enhance the design. Six bills are quilted. Eighteen more to go. I'm going to need to buy a lot more green thread before I'm done. The official name for this artwork is now Dispensed. After cutting the cotton batting (the stuff that goes inside a quilt) for the dollar bills, I realized how heavy and bulky the finished result would be, so I downsized a lot. Now I'm using only half the dollar bills and flannel fabric for the middle "batting" layer. After preparing the materials, I vacuumed my studio floor, moved some furniture aside and started pinning the fabrics to the carpet, one at a time. The first layer, the green flannel, had been cut precisely one kitty wide. Once it was spread on the floor, the in-house quality inspector did a surprise spot check to see if the width of the fabric met the designer's tight specifications. As you can see, it passed. 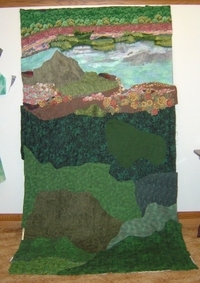 Here's a picture of all three layers pinned together. 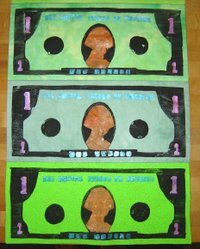 The backs of the dollar bills are face up because the quilt was turned right side out later on. 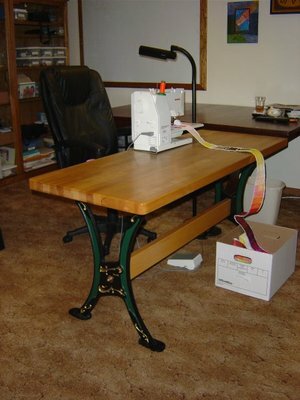 To sew around the three sides, I moved my sewing machine to another table and placed a blanket on the floor behind it. As I stitched the seams, the blanket caught the long quilt as it scrolled off the back, so the money stayed clean. Truthfully, I have a "thing" about keeping dirty money in the house and already have another project planned for the leftover bills, called Laundered. After stitching, I turned the long tube with the help of a foam pool noodle. I frequently use pool noodles in my artwork, both as raw materials and tools, so I keep an extensive and well-catalogued collection in case I need a particular color, shape or size. After seeing their many uses, some of my friends have become converts and now carry around their own noodles, which are actually quite versatile and can substitute for a Swiss Army knife in certain emergency situations. Did I mention I like color? I couldn't leave the dollar bill alone. George is now orange, the numbers in the corners are metallic pink and the "text" is flourescent blue. Ah, that's much better! 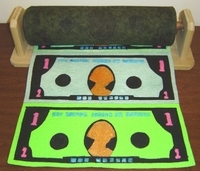 Most of the dollar bills will be hidden inside the roll, so I'm having fun with them. Several Georges have already gained an extra accessory, like a mustache, an earring and eyeglasses. Any suggestions? Unless the quilt is unrolled all the way, no one will see these, so it would be our little secret. After ironing and trimming each bill, I pinned some of them to my design wall. I calculate that I have enough to make more than 10 yards of quilt, 17" wide. In fact, I have so many that I will probably drop a few of the bills, the innocent victims of stamping mistakes. I promise to give them a good home. I made the dollar stamp last night. 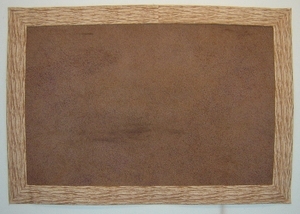 The base is a thin piece of wood, cut 16" x 6.5". The printing area is built up from double layers of high density, self-adhesive weatherstripping. Click on this image to see a larger picture, showing how it was constructed. I could have created a cleaner, more complex design if I knew how to do screenprinting, but I don't, so this is what I'm using. If anyone asks you, tell them that weatherstripping has a deep spiritual significance for me. 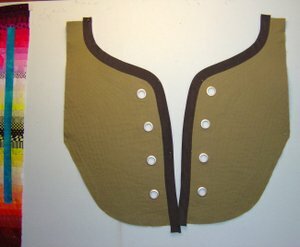 Here's a test stamping on one of the green fabrics. I used black acrylic paint, thinned with a bit with water, and mixed with black lava texture medium. I will add details to the dollars later. I covered four tables with plastic and stamped 50 pieces of fabric before I ran out of paint. One of my artworks, Prepackaged, is hanging on the wall behind the table. Does it look like I'm a counterfeiter? Fifty prints don't fit on my tables, so I moved the fabric to the floor to continue drying. My cat waited at least an hour before coughing up a hairball just inches away from this very spot. How kind of her. Slowly but surely, I've been making progress on this project. Once again, I changed my mind regarding the fabrics for the quilted roll. Now I'm using various shades of green. In the past two days, I rough cut two 10"x20" pieces from each fabric (for the front and back) and ironed them thoroughly flat. 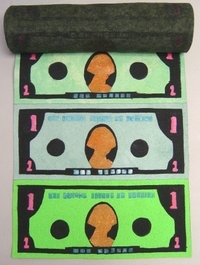 Next, I'll create a very large stamp with the stylized image of a dollar bill on it. I plan to stamp this image on each piece of fabric, so the final roll will have a dollar bill showing in each quilted section. The money theme will work well with several naming possibilities, like Disbursed and Dispensed. This evening, I will be giving a gallery talk at The Fiber Studio here in Wichita, Kansas. 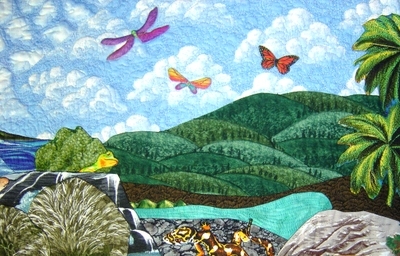 I'm currently in a wonderful show there with three other fiber artists, Anita Knox, Shin-hee Chin and Marilyn Grisham. Two of us were not able to be there for the opening reception, so we are offering a special gallery tour tonight. I will also be demonstrating fabric stamping, to make it more fun. This is an installation photo of the exhibit and you can see two of my works, Knitted and Forest Floor. How do I develop my ideas? Here's the second installment as I document a new work in progress. For the past several days, I've been designing this project in my head. I wanted to give more substance and meaning to my original concept, but didn't quite know how to do that, which delayed my start. To get the creative juices flowing, I spent a lot of time yesterday selecting some hand dyed fabrics from my stash. After all this work, I decided to use white fabric, but that wouldn't look very interesting in a picture, so I'm giving you the more colorful version. Perhaps I'll find a way to incorporate these fabrics into my final design. My friend once said I didn't know how to finish a piece of artwork until I knew its name. That's true more than ever, which is why I'm changing the name of this project before I even start. As of now, the working title is either Disposed or Dispensed. The final choice will probably depend a lot upon whether I create a wastebasket. How does an artist get an idea? This one starts with a piece of wood. My husband originally cut this board to be the base for the wall in Segregated, a recent artwork of mine, but I decided not to use it after all. As boards go, this isn't anything fancy, but I wanted to keep it in my studio anyway. Finally, a few days ago, a lightbulb lit up above my head and I've started on a new project which uses it. 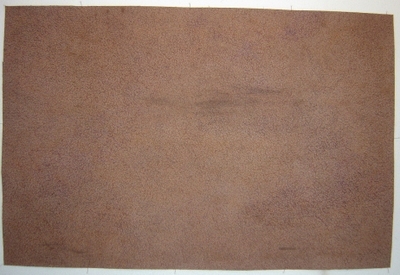 The working name for this artwork is Unrolled and the physical look will be similar to a paper towel dispenser. The board will be mounted on the wall and have brackets attached to the front, holding the dowel that goes through the roll. I plan to use a PVC pipe as the equivalent of the cardboard tube, with a long quilt representing the material rolled on it. I haven't started making the quilt yet because I want to put a design on one side of the quilt that is revealed as the quilt is unrolled. So what design do I use? 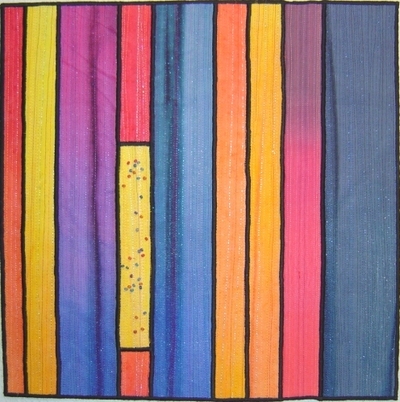 Should it be an abstract design that flows along the length of the quilt? Or should it be something more concrete, like a time line? My current direction is to give multiple meanings to everything I create. Considering this, an abstract design doesn't seem to be enough, even though it would be the easier route to take. Artists rarely take the easy route just because it's easier, so I guess this will be a long term project (again).